"SVAD is my second family and I wouldn't be where I am today in my dance career without them." I have been given the great opportunity to teach all three Yerigan girls. It has been a joy to watch these sisters grow as dancers, athletes and young women. They support each other in every aspect of life and have very supportive parents that have given them great guidance through it all. Stephanie, the youngest, started dance in 2004. Each week would be a surprise if she would make the choice to come into the classroom or not. She wanted to make her own decisions! Stephanie is now fourteen and has made the decision to work towards a career in dance. I am proud of the dancer she has become here and look forward to the knowledge she has gained while at her summer intensives. She has grown not only into a beautiful dancer, but a respectful, responsible young lady. I look forward to what the future holds for this determined girl. Thank you Yerigan family for the experience you have given me to be a better mama. I've been dancing at SVAD since 2002. 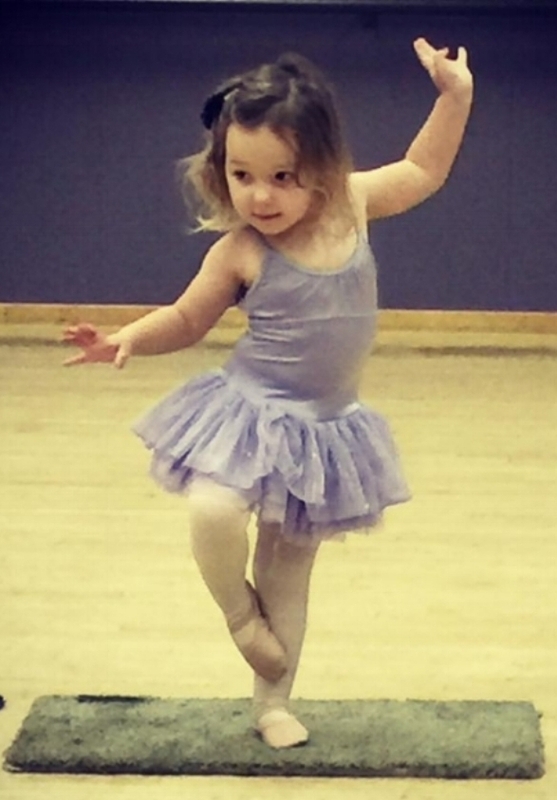 I started dancing when I was 2 years old and have loved it ever since. Both my older sisters Alexandra and Madison have also danced here so my family has been a part of the SVAD family for a very long time. I have danced in many recitals and performances of The Nutcracker and had the honor of dancing the role of Clara in 2014, and Sugar Plum Fairy in 2015. I am a part of Dansations Performing Arts Foundation and have been to regional and national competitions with the team. I also have traveled to other competitions as a soloist. A couple years ago I realized that I may want to be a professional dancer in the future, so with the help of my family and teachers, I decided to audition for many professional companies to be able to attend summer intensives programs. In the summer of 2014 I danced with The Joffrey Ballet School in New York City for five weeks and then flew straight to Orange County, CA to dance with The American Ballet Theatre for three weeks. The next summer I danced for three weeks with the Joffrey Ballet Academy in Chicago, IL. I have had so many amazing experiences and none of it would have been possible without the help and support of my family, teachers, friends and most importantly, my mom who is always finding me more opportunities, being at every competition, performance or class demonstration cheering me on and for reassuring me that I can accomplish anything I put my mind to if I work hard and never give up. We were looking for something fun for our daughter Alexandra to do during the summer and saw an advertisement for summer dance classes. That summer fun put our daughters Alexandra, Madison and Stephanie on a path in dance that would include many dance recitals, Nutcracker performances and dancing competitively with Dansations. The dance instructors fed their passion for dance and took an interest in triumphs and struggles both in and outside of the dance class. Our girls knew they always had the support of their "Dance Family". The confident young women they have grown into can be attributed in part to them being a part of SVAD. Jennifer was Alexandra's teacher for her first dance recital. Now to see Jennifer with her daughter Kaya beginning their dance adventure is very fun for our family. Stephanie's passion for dance had her considering becoming a professional dancer. SVAD's teachers helped her look for ways to expand her dance experience. She auditioned for professional dance companies hoping to be chosen to attend their programs. In the summer of 2014, she danced for 5 weeks in New York City with the Joffrey Ballet Performance Intensive. The day after the final performance she flew to California. At the University of Irvine she danced for 3 weeks with the American Ballet Theatre Intensive. This past summer she danced for 3 weeks in Chicago with the Joffrey Ballet Dance Lab Intensive. She has also challenged herself by attending dance competitions as a soloist. She has traveled to California, Colorado and Pennsylvania. Experiencing new venues, competition schedules and workshop classes has given her the opportunity to take charge while representing herself and SVAD well to other professional dancers and teachers. Stephanie danced the role of Clara in SVAD's Nutcracker last year. She felt the responsibility a professional dancer would encounter. Dancing with a partner, working with a core of dancers and the exhilarating feeling you get being a part of a great performance. This year she is dancing the role of Sugar Plum Fairy. She is looking forward to performing this on stage. Stephanie's growth in dance has shown her taking extra classes, working hard, paying attention to the details and even shedding a few tears are all part of the life of a dancer. Thank you to SVAD for 18 fabulous years and more to come.